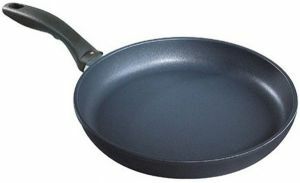 Coated pans are easier to clean than most non-coated pans, and require little or no additional oil or fat to prevent sticking. If the pans are properly handled and not damaged, they give good results for much less hassle. Non-stick pans must not be overheated. Nonstick coatings tend to degrade over time. In order to preserve the coating, it is important never to use metal implements or harsh scouring pads or chemical abrasives when cleaning. It is good to use rubber or wooden utensils only.